For many years lucky Europeans got the ‘good’ version of the Ford Focus, but starting in 2011, American car buyers will finally get to buy the real thing. The 2012 Ford Focus unveiled at this year’s North American International Auto Show is nothing like the dull econo-box we have had to deal with for years. This new car will likely be serious competition for Honda, Toyota and GM in the compact-car market segment. Globally Ford will offer the Focus with ten different engine options. In the US, a 2.0 liter direct-injection 155-hp engine will be standard. An Ecoboost option will likely be available as well for people that are looking for a little more horsepower. Unfortunately it’s unlikely we will ever see the 1.6 liter diesel engine stateside. To improve fuel efficiency, Ford is using its new dual-clutch, fully automatic PowerShift transmission. Ford is claiming the new transmission will improve fuel economy by 9 percent. A transmission this sophisticated is almost unheard of in this market segment and is a real surprise. Ford is using every trick possible to eke out a rumored 40 mpg on the highway. The Focus may be the first non-hybrid car to have stop-start technology. This technology shuts the engine completely off when the car is stopped and fuel will not be wasted idling at traffic lights. When the technology is implemented correctly the engine starts and stops are seamless. The build quality appears to be much better than previous models as well. The new body is 25% stiffer than the last generation and features high-strength steel throughout. The interior may not be the best in its market segment, but it looks very good. An optional touch screen ‘infotainment’ system named MyFord Touch will also be available. The system will feature voice commands and even a web browser. Ford is a company currently firing on all cylinders. Almost every model they sell is improving by leaps and bounds. It’s about time American car buyers finally get a chance to buy the European spec Focus. For years we have been stuck with the rather ‘meh’ Focus with rental car styling. Hopefully, Ford can still price the Focus competitively. 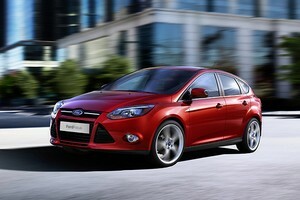 With all of its high tech features, the 2012 Focus could end up rather expensive. Expect to see the 3-door and 5-door Focus to launch early next year and a hybrid model to follow a year after. I have held onto my 1990 Camry wagon for twenty years because no one builds a small wagon. Please Ford, give America the wagon you give Europe. I can’t just understand why Ford isn’t introducing to the North American market the 1.6L Diesel engine which it has running in Europe. bring this diesel engine to the States is behind my understanding. C’mon, Ford. I know you want to…. What will it take to get the Wagon back to the States???? Ford, we’re beggin over here and no one’s listening! It really is about time that FORD started making damn good cars. Can’t wait for the FOCUS to get here. I wish they would sell the RS version here but they wont. FORD wont sell us a car that puts the MUSTANG to shame. I too hope they will bring the Focus RS to the states. I want my malto meal, I mean, I want my five door hatchback! Hopefully they’ll be releasing an RS version as well. That way they can compete with the SI… maybe even MAZDA3SPEED, STi, and GTI? We’ll see if Ford will finally bring their home country a nice focus. Why do the American auto makers think the diesel autos won’t sell in the US? Haven’t they noticed how in-demand the VW TDIs are? We DO realize we won’t be getting the old “bus motors” with the new Turbo diesels! I drove this car in Greece last year. It was a 2009 model. It drove better than my VW GTI. I will def buy this, best selling car in Europe and we finally get it! Ford,get this car to America,FAST! The only good choices that we have are in this category are the VW Golf and Mazda 3. Please help us buy a Ford rather than another foreign maker. Also,we are ready for a Turbo Diesel version! can’t wait to get rid of my ’09 corolla. finally something to get excited about, once again! To the enthusiasts at Ford, Bring the RS here, that car rocks. You’ll sell lot’s here, trust me. Why oh why no TDCI? Why isn’t Ford thinking about bringing the 1.6 diesel to the North American market? Hybrids are hype. Ford, don’t make me go to zee Germans for a TDi! I hope they bring the RS to the US market. Sales in foreign companies are killing ford. Unfortunately they waited so long to bring a good hatchback to the limelight. It doesn’t make any sense for an American company to cater specifically to Europe and neglect consumers needs here. I’m another car shopper looking for a station wagon. Please Ford, make the wagon available in the US. I previously rejected buying a Focus because the seats were not comfortable like those in the Taurus (two of which my wife and I currently have). However, I want a Focus EV and I hope they have a leather seat upgrade available. I heard the Focus station wagon will not be offered in the US. Can anyone verify this? Why would Ford consider not selling the wagon in the US? I am really looking forward to the BEV version (battery electric). I am really hoping that Ford can make the body lightweight enough while being strong enough, too to justify BEV as a viable option. For me it is going to be either Ford Focus BEV (makes the most sense), or Aptera (great on paper and would fit the bill for my needs, but can you say vaporware so far? ), or Tesla Model S (a bit too expensive for a daily commuter car). Either way, I see zero reliance on gasoline as a requirement for the next car I’m going to buy. Will it be Ford or something else, only time will tell. In the meantime, I will continue driving my trusted 2004 Acura TL until the right product comes to market for me to move to. there realy just giving us the european look with a bunch of fancy nav systems and stuff.. the engines do have a little more power now, but the best selling focuses over in europe are the desiles and the ecoboosted six speed manual 5cylinder volvo engined RS. i’m not realy big on desiles, but the ford focus RS IS THEE best ford you can buy. its realy the only car from ford thats worth buying new to me.. so if they bring the ecoboosted focus rs over to the states, im sold. if not, than i’ll just buy an imprezza with a turbo in it..
other makes. What is wrong with a “Econo Box” if that is your taste? coupe model and a manual Transmission! I hope they leave many things optional. The thing that made American cars great in the past was how similar a car could be yet also be so unique. Like Ford offering EcoBoost with the capability of still getting a barebones stock interior would certainly improve their competitiveness in the compact market (if they could keep the price affordable). Japanese can keep competitive even with pedal and airbag issues because of their resonably priced vehicles… Ford is tending to be a little higher priced in recent history… I do not know if they think people will not notice, but I certainly have. They need to convince people that the higher price is worth it plus offer a pony of every model. I love the look of this Car it reminds of what Saab 9-3 would look if they had been able to afford a new model.Ford is so red hot in Europe right now and they should heat up here.The Focus needed to be upscale because that’s the segment we are moving towards and it’s worth it.Why can’t Fords be aspirational vehicles they have been doing that in other markets.A British friend asked me why Americans don’t buy there own cars and I had to say because we are stuck in the past.30 years ago we had to sell cars super cheap and could not push the prices up like the Euros and our assembly lines got stressed and the quality suffered .That’s the past but we are a stubborn bunch even when it’s to our detriment.